A wonderful thing happened at My Word Wizard (MWW) in September of 2011. We began to receive an amazing collection of poems from a small town in Texas called McCamey. We soon learned that the poems emanated from McCamey Middle School, and were written by a group of highly talented young poets in Ms. Hall's 6th Grade Language Arts class. These budding writers were the pioneers of a collaborative effort between McCamey and MWW that continues to this day. They were also the first poets at McCamey to be awarded the prestigious My Word Wizard Award for Excellence in Writing. 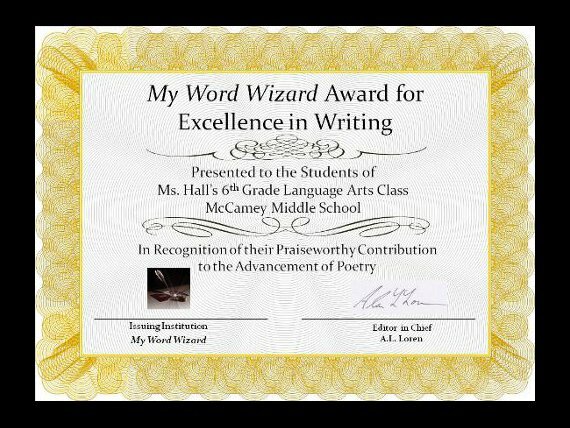 The honor was subsequently bestowed on the poets of Ms. Hall's 5th grade Language Arts class. An equally talented group. Our editorial team has culled through the voluminous library of McCamey 6th grade poems and we are proud to bring you a superb selection of their works. We encourage all young writers to take inspiration from your peers in McCamey, Texas. Language Arts is really fun. the elements on the periodic table. My dad is like a hero. My dad is as strong as superman. My dad is the greatest dad in the world! And what was inside was anyone’s guess. When he opened it, guess what came out? An unknown creature who began to shout. He said, "Get outta here!" Then the boy jumped up in fear. trust me you "old coops." The creature fell asleep and began dreaming. My mom said,"Well good for you!" but my mom won't bake. She says, "You're too fat." I say, "I want a cat." she said,"If you want a pet, I'll get you a bat." "Fine, I'll get you a cat." Then I went to chat. My mom said I'm too yappy. Yes, I'm getting a cat. Thank God it's not a bat! The kid was as big as a giant! The other kid was as small as an ant! But they were both best friends forever. And they were forever happy. I see a box, and it has locks. I wonder what's in it. I look for the key and what do I see? A key taped underneath it! I grab the key, and open the box. I jump out of my socks! It is the scariest creature I've ever seen! Oh, and it really looks mean! almost as bright as a ripe orange. Her hair is like dark, dark chocolate. She has teeth like a demon. Her ears pop up like horns. Sometimes she bites me for fun! She is mad and bad as the devil. My 3 Sisters are stuck by my side! It's the greatest thing God gave me this year! Without them I would be a loner! But I have them with me all the time! you could never find them! Their names are Rya Deleon, Viviana Diaz & Kimberly Cavozos! My brother fell and hit his head. And he landed in a puddle of water. And he got up and ran home as fast as he could. and went to his room. but finally it was over and he got hungry. I had a grandma that I loved. I loved her a whole lot. I can't stand being away from her. and we always spent time together. She passed, and I couldn't believe my eyes. I pray for her every night. She wasn't just my grandma, she was more. She was like a sister, mother, and best friend. When I think of her, I cry inside and out. She was nice, caring, and thoughtful. She was always sick, and always in the hospital. Now she's up there with the angels and the Lord. I love you Grandma, and I always will. I might have fights with them, but still I LOVE THEM!!! I LOVE MY TRUE SISTERS!